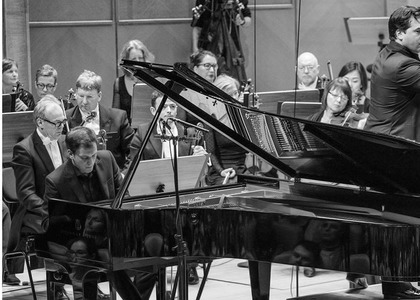 Concerto No.3 for Piano and Orchestra by Serghei Prokofiev opened the third RADIRO evening. Under the baton of Robert Trevino, one of the most appreciated young American conductors of our time, the German Radio Symphony Orchestra from Leipzig, the oldest in the world, returned to the stage of Sala Radio. Mihai Ritivoiu, laureate of the International Contest George Enescu played the piano. He also performed an encore for the audience, Sonata No. 247 by Domenico Scarlatti.